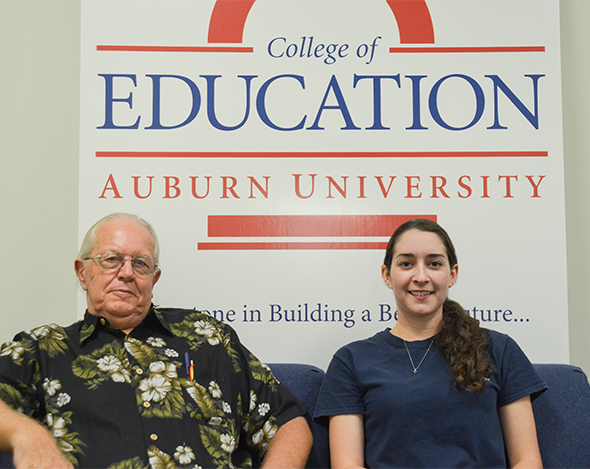 Katie M. Sowell of Prattville, Alabama, is set to become the first-ever graduate in the College of Education’s new Master’s of Agricultural Leadership program. Following an undergraduate career in Interdisciplinary Studies with an emphasis in Business, Biology, and Animal Science, Sowell had an internship with the Alabama Cattleman’s Association. She was drawn by this experience to want to stay in the agricultural field but was uncertain how to proceed. Someone suggested she talk to Dr. James E. Witte, a COE professor who specializes in Adult Education and is the program coordinator for Agricultural Leadership. Sowell did not grow up with a family background of agriculture but, in her words,“fell in love” with agriculture through her classroom and field experiences. This was especially true of animal science. Witte believes his first graduate is setting a standard that many will follow.